The multi-colored digital Reference Book provides valuable information American Patriots need to restore the Sovereignty and Freedom of the American people. In eBook format, our three color indexed resource manual is a powerful searchable PDF (Portable Document Format) file allowing the user to find information in an instant. The eBook format additionally supplies volumes of source and reference material from the Internet to your computer with a mouse click. 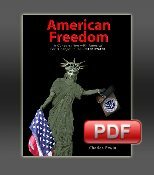 To our knowledge, American Freedom is the only publication chronicling this massive amount of freedom information in one Reference Book. Please enter a valid email address and a download link with your eBook will be sent to that email address. When downloading the eBook select the SAVE option. Your information will not be released or sold. You must have a valid credit card to complete your order or you can use PayPal. Transactions on the site are protected with up to 256-bit Secure Sockets Layer encryption so your credit card information is secure.